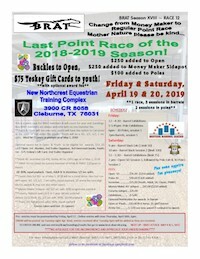 The Barrel Racing Association of Texas was formed in April of 2001 by a group of local barrel racers who wanted to have a barrel racing association that provided some of the qualities that they themselves found to be important in a well-run jackpot. Qualities such as starting on time, providing good ground, good payout, an outgoing, friendly staff, quality awards and a wholesome, family atmosphere. BRAT’s first year started with approximately 35 members and offered only an Open 4D division. We are now in our fifth year of competition and have grown to an amazing 156 members. We now offer not only an Open 4D but also a Youth 3D, which is growing by leaps and bounds. 53 of our 275 members for the 2012-20136 season are 15 & Under Youth members. We pride ourselves in providing our members with an association that they can be proud to be a member of. We have an open door policy where anyone can come to us with input and know that it will be accepted with appreciation and enthusiasm. We love to get new ideas and know that without our wonderful members and sponsors, BRAT would not be possible. In the past four seasons, we have awarded over $100,000 in cash and prizes to our contestants. We award the Top 35 places in the Open and Top 20 places in the Youth with prizes consisting of Top 15 Saddles in the Open and Top 5 saddle in the Youth, Buckles, Back Cinch Buckles, Breast Collar Buckles, Headstalls, Blankets, Cowhide covered notebooks and day planners, Trophy Key Chains, Halters, and a large variety of other useful awards. 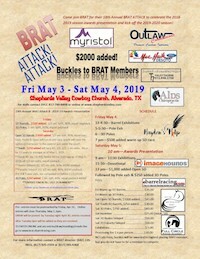 BRAT offers several award jackpots during the point year where contestants in both the Youth and the Open classes can run for Top 3 awards in each division and take them home that day. Since 2001, we have gone from averaging 50 entries in the Open and 20 entries in Youth at our monthly jackpots, to a current average of 40 Youth entries and over 200 Open entries each month!! We are looking forward to growing even bigger and better in the coming years and offering even more saddles and prizes to our members. If you are looking for an association where you can come and relax, have fun, and go home with a smile on your face….BRAT is where it’s at!